[52 Weeks Challenge] Week 15 – Post a screenshot of the game you’re playing right now – I ❤ Old Games! If you’ve read the last entry of my weekly “Guess what’s next on I ❤ Old Games” post I’m playing a lot of games at the moment, so the featured image is just one of them, the one I’m about to finish (and unfortunately is taken by google since I cannot capure my video 😦 but at the moment I’m exactly at that point of the game). I’ve been playing Resident Evil 4 for like two months, with a pause in the middle because the CD I have has a deep scratch in the middle that prevent me from going further chapter 3-3. I had to buy another copy so at the moment I’m almost at the end: I’ve just started the 5th and final chapter (there’s also a chapter 6 but it’s just a battle) and things are becoming quite complicated since I’m running out of ammo. I thought I didn’lt like RE4 but, even though is ligh years away from the atmosphere and the plot of the first installments, in the end I’m enjoying a lot this particular chapter of the series. Of course the over-the-shloder- point of view is not so “Resident Evil” but it’s a solid game anyway. Another game I’m playing is the first Resident Evil on the PS1. It’s been 20 years since the last time I played it on the Playstation and it still scares me even if the other games, like RE2, RE3 and Code: Veronica X are way scarier! Right now I’m also playing Deus Ex for the PS2. I loved the PC version back then and it was one of the first FPS I’ve ever completed so now I’m trying to get to grips with the PlayStation version. Next Post [RetroPicks] The Legend is here! 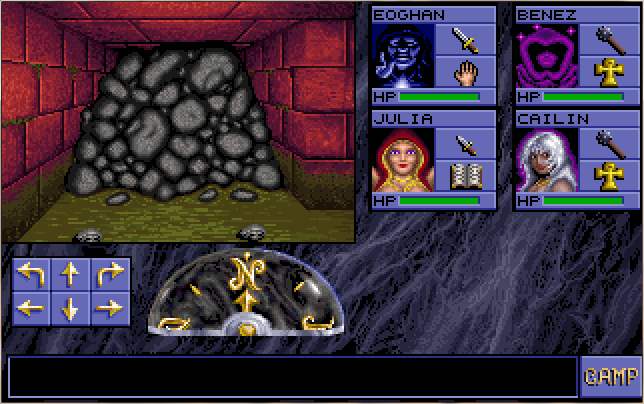 I remember Eye of the Beholder coming out but I don’t think I ever played it. I heard good things though. I am playing Tails’ Skypatrol because I am currently writing a review about it. I am also playing Legend of Zelda: Twilight Princess. I liked the reason for playing Eye of the Beholder. I find it unusual that you are playing the first game in a series at the same time as a later game in the series. Why did you decide to play Resident Evil as well as Resident Evil 4? Which game do you prefer? Are you enjoying the RPG game? I’m currently resvisiting the Mortal Kombat X mobile app as I’m hyped for the next Mortal Kombat game, which is due to be announced just before E3.